Today, we’re launching Picasa for Mac (in beta) – free soft ware that helps Mac users easily or ganize their photos in one place, edit pictures, and share them online with friends, family, and the world. Many of us take pictures so that we can show them to the people we care about. Picasa for Mac integrates seamlessly with Picasa Web Albums, Google’s free photo-sharing site, whic h offers features lik e name tags – the ability for users to automatically organize and share their photos based on the faces in each p icture. People who already share photos on Picasa Web Albums will find that Picasa for Mac allows them to easily and quickly manage their online and local photo collections. Millions of Mac users have been sharing photos on Picasa Web Albums , and while we’ve previously offered a Mac uploader and iPhoto plugin for Picasa Web Albums, Picasa includes additional sharing features like automatic web sync. 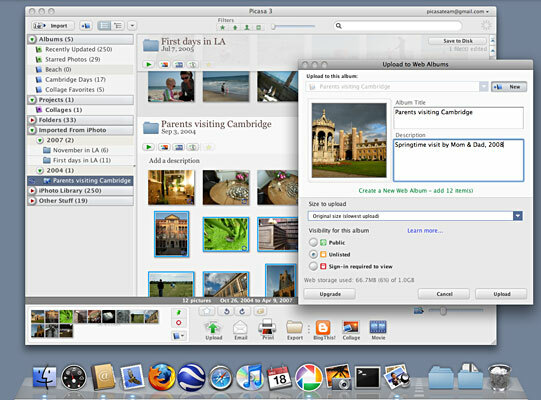 Picasa for Mac "plays nice" with iPhoto, and takes a read-only approach to editing photos stored in the iPhoto library, duplicating files as needed, so that users’ iPhoto libraries are never affecte d when they use Pic asa. Avid iPhoto users who currently use our Picasa Web Albums Uploader plugin can continue to do so, although features like automatic web sync, photo collages, and more will only be found in the Picasa application. This first beta of Picasa for Mac matches the speed and most core features of Picasa on Windows – and we’ll be working on m ore refinements to the Mac interface and feature set as time goes on. Picasa for Mac is available for free download in US English at: picasa.google.com/mac/. We’ll be demoing it live at the Google booth at Macworld 2009.